Some of the fine Dave Glass pictures from the 1970’s in this set give these San Francisco locations a hard-edge or seedy look, but also something of a quaint charm in a few of them that’s still there 40 to 45 years later. 18th and Mission Streets in 1979: E NIE RAABE FOR SHE IFF HE CARES HE KNO S. Well, if he was elected, I hope the first thing he straightened out was that sign. The J Line drop from Liberty Street to Delores Park in 1974: Some of those old streetcars are the type they run along the vintage F Car Line along Market Street and the Embarcadero today. This area has the feel of old Brooklyn from movies like ‘Arsenic and Old Lace’ when the streetcars rattle past. Mission Street north of 18th Street in 1974: Lakeside Liquors is gone now. It may not have belonged here anyway; this is in the heart of the Mission District, and the nearest lake from here is probably across town in Golden Gate Park. Ellis Street at Divisadero looking west in 1977: Road hog! Actually, this was a good thing. In the 1970’s when they were demolishing many old Victorians in the Western Addition, some enterprising people bought a few of these old houses for “pennies on the dollar” and moved them to different locations. They are worth a LOT more today! The northwest corner of Page and Octavia Streets in 1979: Wow, they had everything you need there; beer, liquor, cigarettes, Pepsi, 7up, sandwiches. How did fruit get in there? I read somewhere that Fisherman’s Wharf is the second largest tourist attraction in California after Disneyland, and I believe it. During the summer, you often can’t tell the difference by crowd size of either. But winter is closing in and Fisherman’s Wharf has quieted down a little. ‘I Wonder as I Wander’; that’s an old Christian folk song from the 1930’s, popular around Christmastime. I had the song stuck in my head as I was taking these pictures. I sometimes wonder as I wander around San Francisco too, although not always with religious bewilderment, like the person in the song. Today, I was wondering what makes Fisherman’s Wharf so special, and it is special. True, the views of the Bay from certain spots here are stunning, but I doubt if most of the tourists ever see them. Sometimes it seems that the majority of the crowd accepts an hour or two of overpriced parking just to linger around the north end of Taylor Street past Jefferson. That’s okay too, it’s good for business. Me, I usually like to wander around where the bilge rats (the real ones) take their shore leave. Sometimes, it’s kind of fun to explore the back areas of Fisherman’s Wharf and pretend that you’re a scalawag just off of a ship looking for an opium den, or something like that. However, most vintage pictures were taken at the tourist spots, like the pictures in this set, and they’re fun to visit too. Taylor Street, looking south toward Russian Hill from Jefferson Street: I couldn’t get a date of this picture from skyscrapercity.com, but it looks like the mid to late 1950’s: Notice the Standard Station on the left in the vintage picture. There was a gasoline station on the northeast corner of Jefferson and Taylor Streets from the 1930’s until the mid 1970’s. Originally it was designed to look like a ship, as you’ll see in the next picture. This was a photo I took a few years ago looking northeast across Taylor Street toward where the SS Fill ‘Er Up, or whatever it was called in the 1930’s, once was. By the mid 1960’s the station was remodeled into a more conventional and less interesting look. Fisherman’s Wharf Boat Lagoon in 1940: This is not only my favorite from the Charles Cushman Collection, but it’s also one of my favorite San Francisco pictures. Jefferson Street looking west from Taylor Street: Life is not a Thomas Kinkade painting, unfortunately. This view has changed little since 1958 in this picture from opensfhistory.org, and I think it’s a fitting photo. Possibly, most people do come to Fisherman’s Wharf for the food. The Mad Tea Party in Fantasyland: That’s Vice President Richard Nixon in the center of the vintage picture. The Chicken-of-the-Sea Pirate Ship in the background is gone now. I’ve subscribed to the San Francisco on and off since college. Now I’m down to only the Sunday edition from the supermarket I stop at, but occasionally I still subscribe to it on a daily basis. It never was the same after Herb Caen died, but what really bothered me was when the replaced ‘Blondie’ from the top spot in the Sunday comics with ‘Doonesbury’! Still, it’s the best newspaper available for articles on San Francisco history, and their vintage pictures of San Francisco are among the finest. Many of them can be seen at the website SFChronicle.com/vault, where these vintage photos are posted. 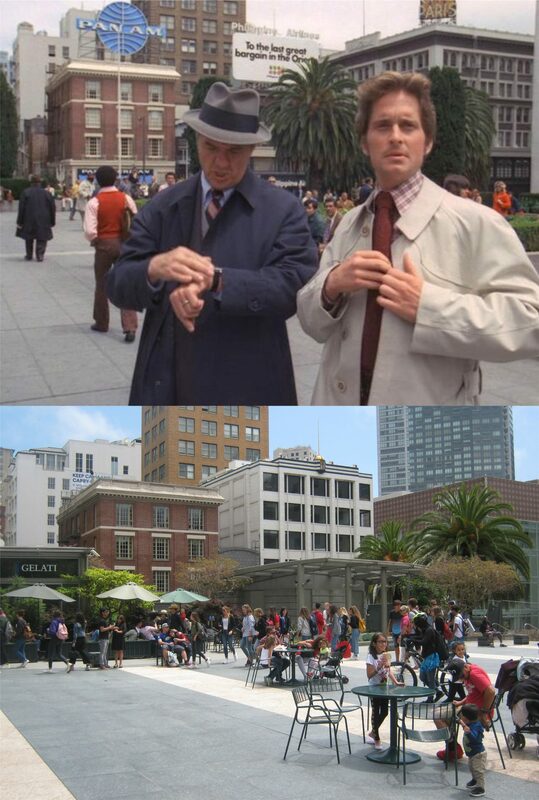 Mime artists Lorene Yarnell and Robert Shields getting married at the southwest corner of Union Square in October of 1972: Robert Shields did a cameo at Union Square in the opening scenes of the 1974 film ‘The Conversation’ starring Gene Hackman. Groucho Marx clowns around with twin students from Washington High School on Powell Street in front of the St. Francis Hotel in July of 1940. My picture would be about where they were walking; the front façade of the hotel has been remodeled since the 1940 picture. On the right in my photo are hotel workers who have been striking against the St Francis and other hotels in San Francisco for employment benefit upgrades. Groucho Marx, sans mustache and glasses, is obviously enjoying his July of 1940 visit to San Francisco as he climbs a light pole south of the entrance to the St. Francis Hotel. The SANTA CLAUS EXPRESS, pictured in my previous post, arrives at the Powell and Market Street cable car turnaround in late November of 1949. In August of 1964 the Beatles stayed on the 15th floor of the newly opened Hilton Hotel on O’Farrell Street, technically in the Tenderloin District. Remodeled since 1964, it’s the largest hotel on the West Coast, according to Wikipedia. In the vintage picture, Beatles fans are waiting across the street from the hotel on the Ellis Street side of the Hilton for the Beatles to arrive from the airport. Seal Rocks at Ocean Beach in 1943: I’m sure that Seal Rocks are somewhere in that old picture, but I can’t quite focus in on them!